While the news of Roger Bernadina's demotion to the minors has pretty much sunk in to Nationals fans (as well as the 1% of Yahoo Fantasy Baseball players who still have the Shark on their rosters), it still doesn't sit well. I woke up this morning laughing. Bernadina was sent to the minors?? What a silly and outrageous dream! As I took Tylenol to help with my hangover, I thought back on the night prior, trying to figure out why I would drink an entire fifth of Sharkwater on a Monday night. When I checked my phone, and saw all the angry response texts saying, "I really don't care how drunk you are", "IT'S 4 AM! STOP!!" and "who is this?" everything came rushing back to me. The crying, the yelling, the police intervention... It wasn't a dream at all. Fortunately, I wasn't the only one who tried to brush it off as a bad dream. As the Nationals reported to camp this morning, many of them were confused and upset when they didn't see their favorite teammate waiting for them when they got there. As the players began asking around, Jim Riggleman was forced to be the bearer of bad news for the second straight day. "No," Jayson Werth responded, "No. No! NO! This can't be. I just signed with the Nats to play with the Shark. Now I have to wait until he gets called up. No!" Before collapsing and bursting into tears, Ryan Zimmerman could be heard yelling, "I THOUGHT YOU WERE JOKING, JIM! COME ON! NOT SHARK!" Ian Desmond, who immediately picked up his fishing pole and walked to the nearest body of water, denied the whole thing, repeating, "No. Bernadina is just hiding. I'm going to find him. I'm going to find him. He's just hiding. Come out, shark! I'm going to find him. 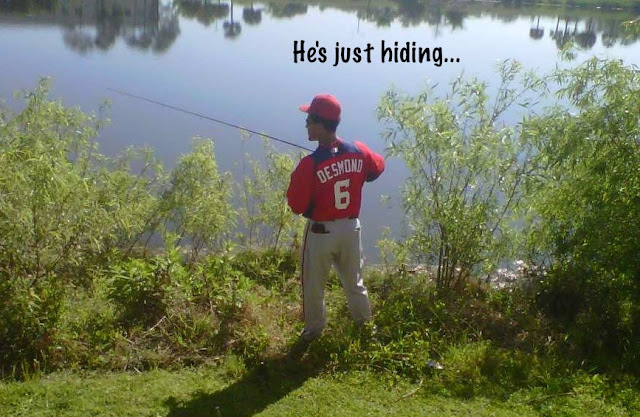 He's just hiding..."
When asked about making the Nationals roster, Matt Stairs replied, "I just wanted Bryce Harper's autograph. Even I hoped the Shark would make the team instead of me. I'm so tired..."
Newest National Oliver Perez could not be reached for comment as he slowly digested in Bernadina's stomach. Honestly, the Shark will likely be called up soon. I just hope for the Nationals' win column sake, it will be sooner.